What does Vilma Santos think of Vilma Santos now? At Sixteen, I guess is far cry from the Vilma Santos I’ve known eight years ago. I remember I was very childish and too carefree then, pretty naïve to what life would seem to offer and…oh yes, physically, I was skinny. But now, in such a little period of time, I’ve learned so many things about life really is, the differences between winning and losing…the many faces of happiness and success and yes, from a skinny girl…uh, what d’ya know, I fully bloomed into…ugh, would you believe fastest weight gainer! Gee whiz, it makes me feel sick everyday. I wonder how I will look come eight years more and the next to come. But one thing is sure, by that time I’m already a full-grown woman. Do you have many friends? What king people do you choose for friends? I have lots of friends. But real friends, I doubt if there are many. I admire persons who know how to mingle with anybody and everybody. I despise the opportunist and the unkind. At present, do you think people you meet are interested in you only as Vilma Santos, the movie star? Nope and…well, yes. There are some. I just don’t know the others. Does acting come easy for you? Well, for me it’s only a matter of little concentration. I study the part I play and try to feel it in more realistic way. Emotion easily gets me you know, especially when I’m already in front of the camera. How do you evaluate yourself as an actress? As a singer? I can act, yes but I don’t consider myself a very good actress yet. I guess, I have to learn more, especially in dealing with everybody, with people who support me and work with me and most especially I still have to learn how to accept criticism open-mindedly, gratefully and patiently in which some of the blasts you’ll deserve, many you won’t. And as a singer, gosh…I feel a funny thing inside everytime na naiisip kong I was not a born singer. But everytime I hear my records play, I couldn’t help but kid myself, that I was made after all. What kind of reaction did you have when your first recording became a hit? Ofcourse I was very very very happy…overwhelmed with joy, for somehow, I didn’t fail my producer William Leary, and the great song writer, Dannie Subido. Did you feel pressure in preparing your LP album, Sixteen? I’ve felt pressure ever since I began to work in show business. Let’s just say, I was a little nervous. Is it true that after you were given five complimentary copies of your first LP album, you immediately gave them to five special people closest to your heart, and the two of them were Jay Ilagan and Edgar Mortiz? Yes, but it didn’t mean anything on my part. It’s just a sort of a token of friendship. Just like when they also gave me a copy of their first record. Is it true that one of your favorite songs which is entitled “Dry Your Eyes” reminds you of Jay Ilagan? Why? Well, its not exactly that way. I mean, kayak o lang nasabi youn kasi… kuwan, ;yon bang…tsk. Kasi kuwa, e ah it reminds me of Jay, because I was deeply touched sa mga write-ups na nababasa ko tungkol sa kanya – na gusto raw niya akong maging ka-love team. But it seems, as he himself said before, were not meant for each other even in real life that’s why I couldn’t help but dedicate the lyrics fo that song to him which goes like this…”Look around, never try to run, for the things to come could be your chance. You’re still young to suffer and to cry, don’t you deny, for I know your part and don’t be afraid to be alone.” And that’s it. Is it also true that Jay and Edgar are two of your most ardent suitors in real life? Hmmm….yes…. Between Edgar and Jay, who of the two do you think has the greater chance of winning your heart? I haven’t thought about it yet. And besides, I enjoy life as it is now – – being free from love worries. Just wait na lang till I have enough time to study the matter closely, huh? Speaking of Jay, how did you feel when you were separated as loveteam in Bata-Batuta? I felt sad, not because si Edgar ang ipinalit sa kanya. It was not Edgar’s fault, nor Jay’s or mine. But I was happy, too not because nagkahiwalay kami ni Jay. Tsk…you see, it’s hard to explain eh! Some people might misunderstand me, so let’s better not talk about it anymore, okay? But do you also dream of working with Jay someday? Yes, why not? Kung may alok, that is. I think Jay is a very nice guy to work with and I’ll look forward to make picture with him in the near future. Why is it that Edgar reportedly always gets jealous everytime you talk with other boys? I don’t know that! All I know is that I’m free to talk with anybody, and I guess, I have all the freedom to do so. What qualities of Edgar do you find most attractive? Ditto with Jay Ilagan? They are different personalities. And qualities too. But I like them both, as friends, that is. Lastly, at what age do you want to go steady with somebody? After my 18th birthday. But it all depends upon the situation, you know. Maybe this year, maybe next year…or maybe never. END. – Published in V Magazine 2006, courtesy of Alan Trambulo. 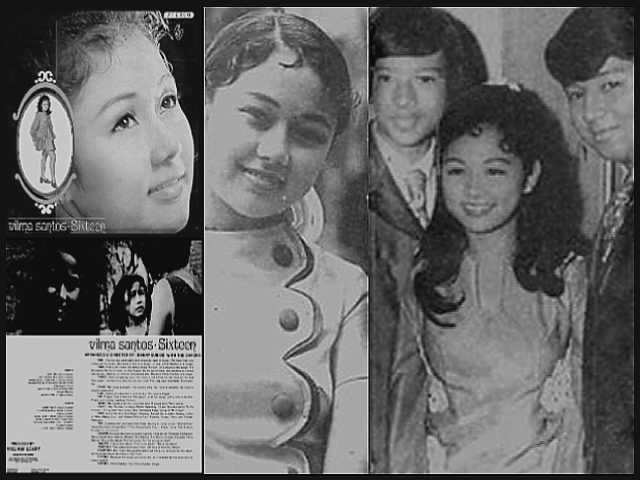 The Reviews: – “Leron-leron Sinta” (1972) started when Gigi (Florence Aguilar) and Beth (Vilma Santos) moved to a new house and found new suitors, Spike (Jay Ilagan) and Noel (Edgar Mortiz). The two pairs swapped partners a couple of times that by the time they decided to elope they decided to stop their civil wedding at the last-minute after they realized they’re all not ready. Leron-Leron Sinta reminded us of Glee, with Florence Aguilar auditioning to a school choir and with several cover songs like Lennon’s “Imagine.” It also featured a funny scene where Edgar Mortiz did a duet with Florence, he, singing in his window while she answered back, singing in their house balcony. Feeling irritated, both Vilma and Jay sarcastically screamed, “wow! ala-Romeo and Juliet!” Leron is watchable but has some noticeable flaws. On the first part, suddenly, we see both Jay and Edgar cross-dressing and we realized that this was a continuity scene of the later part of the film, where Gigi and Beth decided to entertain other suitors (as both got fed up with Jay and Edgar’s courting antics). Like most musical films in the 70s, there’s the typical travelogue scenes. The film showcased the city of Antipolo while the four main characters did some sight-seeing, like tourists. As part of the story, the film showcase Edgar and Florence’s singing talents which were justifiable as both were member of their school’s choir unlike other musical films where the singing scenes were just added with no connections to the film’s story. This can be attributed to a much equipped team of writer, Nestor Torre Jr. and director, Emmanuel Borlaza, who also came up with Vilma’s first significant drama, Dama de Noche. But like so many film in this era, Leron-leron Sinta, also ended with a musical production number, this time, it’s a Christmas medley. Child star Beth Manlongat and Angelito provided some funny moments. And Lilian Laing too. But the one star who stole the film from the four main characters was veteran comedian, Bayani Casimiro who was very funny as the forgetful judge and who tried to marry the four undecided teens.